We are young Christians who have a desire to worship the name of God through singing. We want to show the relevance of choir worshiping nowadays, and wake youth up to praise the name of the Lord through this service. 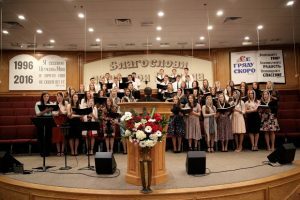 If you are young and you feel the desire to serve God, you are also able to be a part of youth choir and to join us for serving God through choir singing. Rehearsals take place every Monday at 7pm.